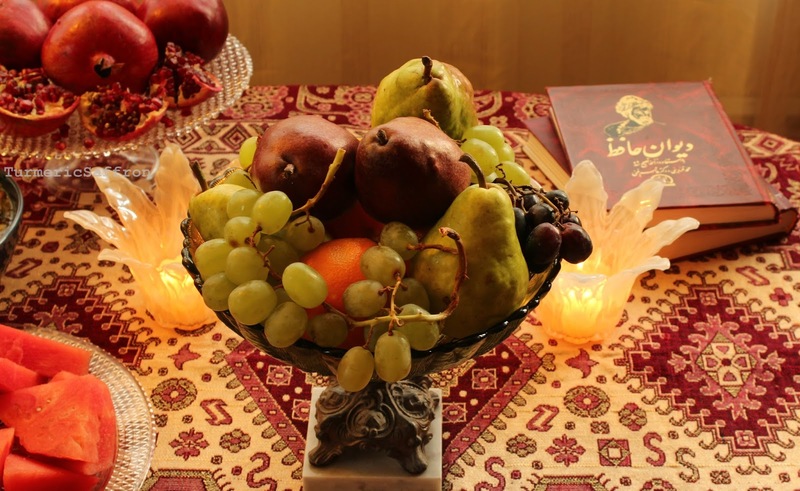 On the eve of the longest night (winter solstice), family and friends gather to celebrate the triumph of light over darkness with delicious food, lively music, good conversation, and the traditional poetry reading of Hafez, the great Persian poet. 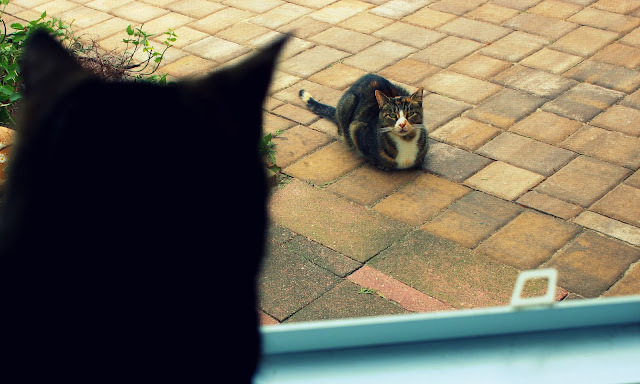 Five years ago, on a typical cold day in December, I created my little blog. 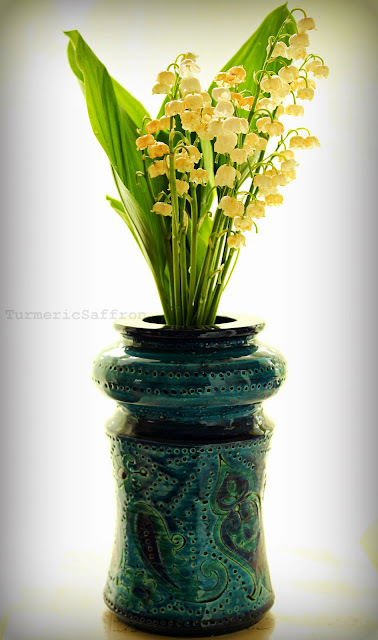 The whole idea of a Persian food blog- its name and format swept over me like a Fall breeze and snowballed into a heightened sense of urgency and passion and that's when "Turmeric and Saffron" was born. I began my new blog with borani esfenaj, a favorite of mine, followed by other amazing Persian recipes such as ash reshteh, loobia polow, and ghormeh sabzi, in that month alone. All I wanted to do was write my mother's recipes and about my memories of growing up in Iran. 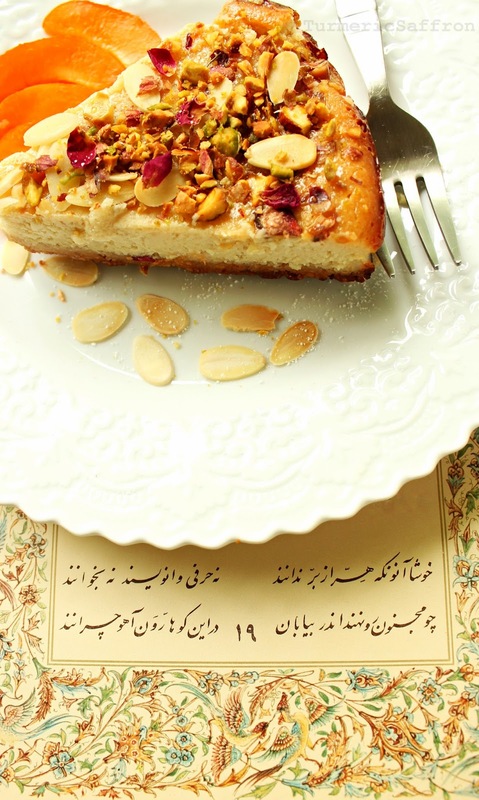 Now, five years later, my blog has an archive of more than one hundred and seventy Persian recipes that are not only my mother's but from all over the country. I am utterly surprised and deeply grateful that I have continued blogging this far. I am grateful that through blogging I found solace and was able to hone my cooking skills in the kitchen and through this experience I have developed my own culinary style. 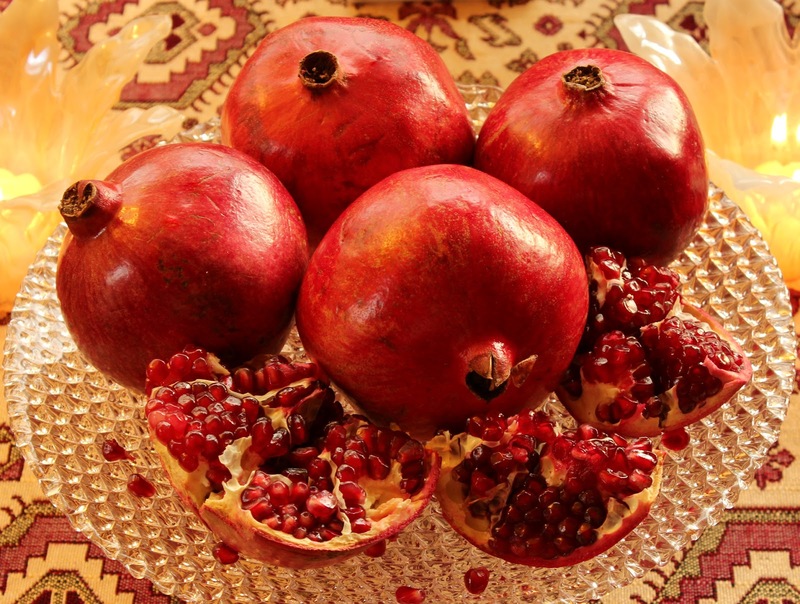 I came to appreciate Persian cuisine more than I ever have and I have become a firm believer that the true and authentic Persian cuisine must be preserved and remain as intact as possible. 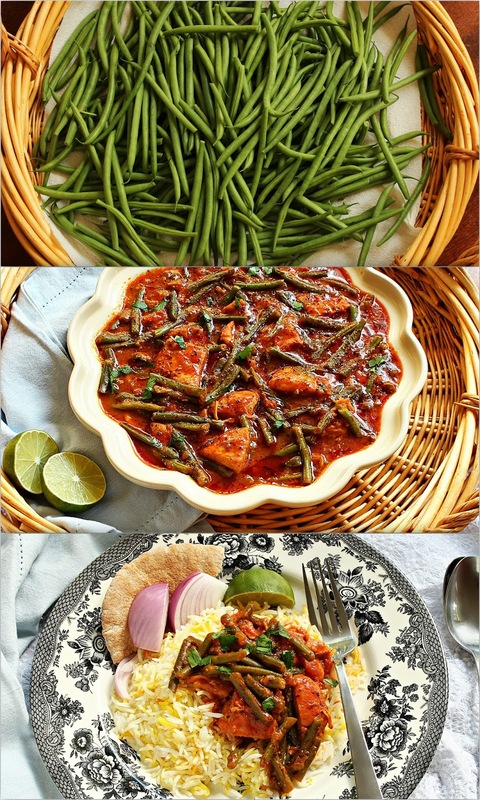 Now, I am an enthusiastic cook who has discovered the joy of photography as well. 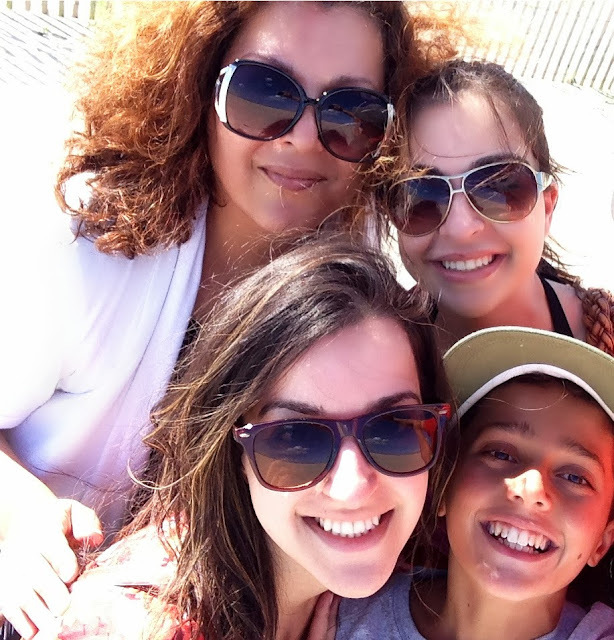 Throughout this process I have also had the great pleasure of getting to know many wonderful and supportive blog readers and fellow bloggers. 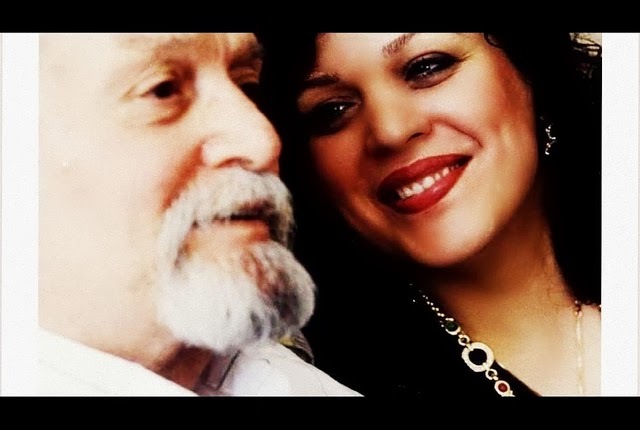 I write so much about my mother and so in order to balance the attention I give to the memories of my parents on this blog I am going to share one of my favorite photos of Baba. 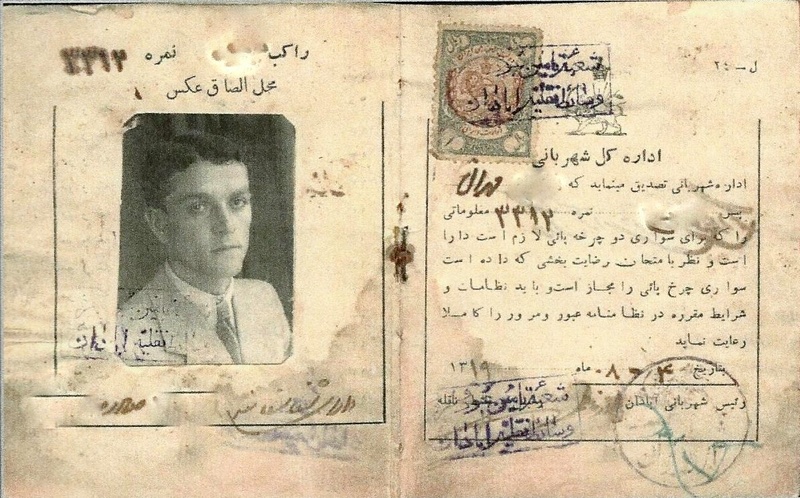 The image below is of his bicycle license that was issued in the city of Abadan, Iran more than seventy years ago. I remember him saying that one of the tests required him to ride his bike over a large figure 8 that was drawn on the ground without getting out of line! 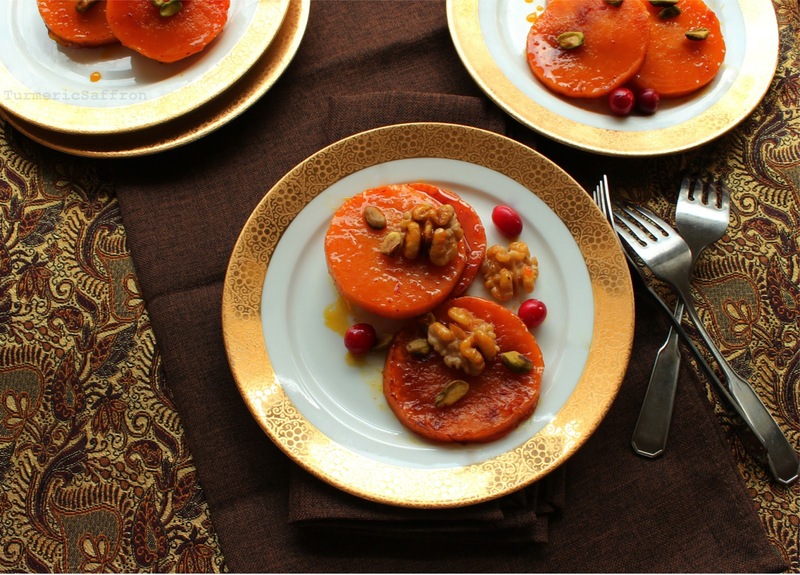 To celebrate my fifth year of blogging I chose to make دسر کدو حلوایی - butternut squash dessert, which is great to make while they are still in season. 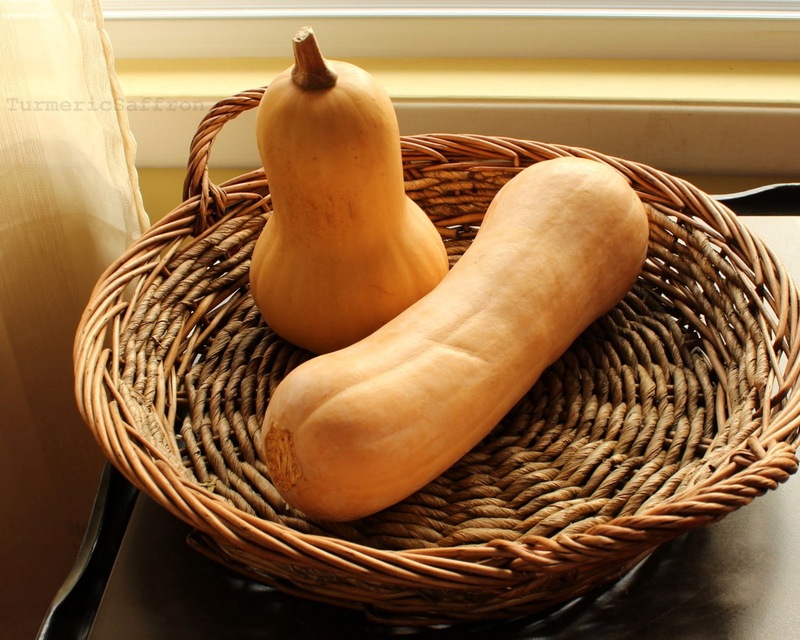 For this dessert you'll need to buy butternut squash with a long neck. I have grown to know this recipe as a dessert from Hamedan which is where my mother was from. 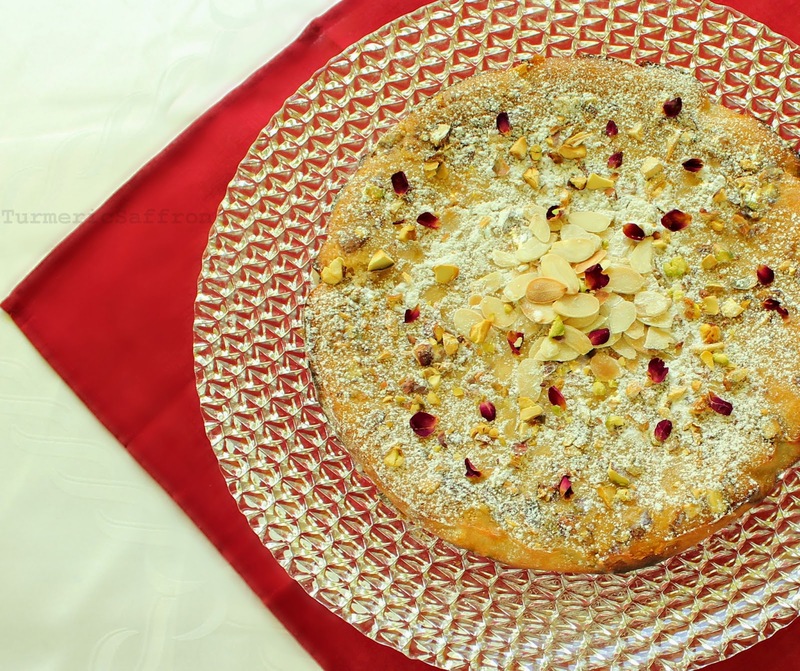 However, she lived most of her adult life in Khuzestan and I am not certain which culinary experience was more dominant in her cooking or if both had influenced her equally. While I too have moved away from my birthplace, my roots remain where I was born. I traveled, moved to a different continent, went about my life and started my own family but my roots remain intact and have reached the water level in the dried lands of Khuzestan where it was planted. 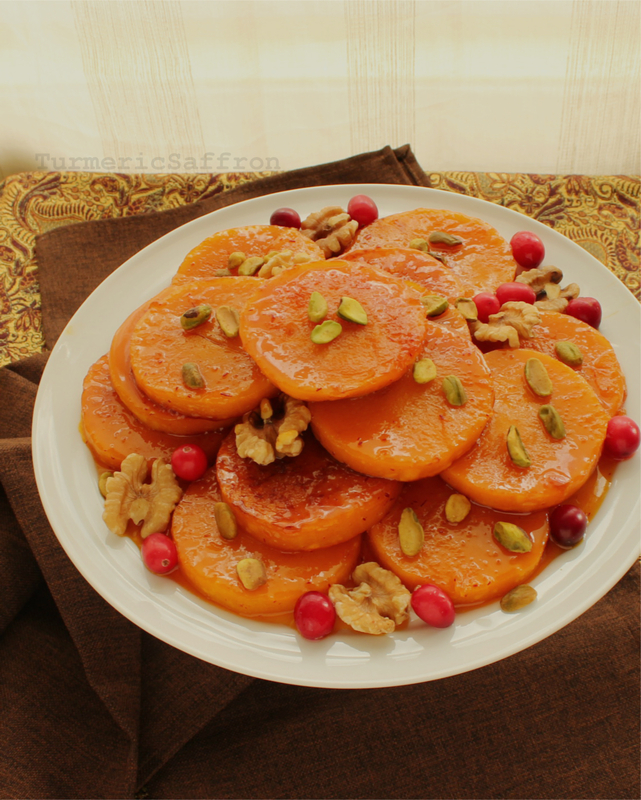 For an added flavor and a southern touch you may make this dessert with شیره خرما - date syrup or for a Hamedani-style pumpkin dessert you may use شیره انگور - grape syrup as sweetener instead of using the regular sugar. In a large frying pan, heat butter and oil, over medium heat. Add the butternut squash slices to the pan. Cook for 5-7 minutes or until just tender. In a small pot, over medium heat combine sugar and a cup of water. Bring to a boil. Reduce the heat and simmer for another 5 minutes. 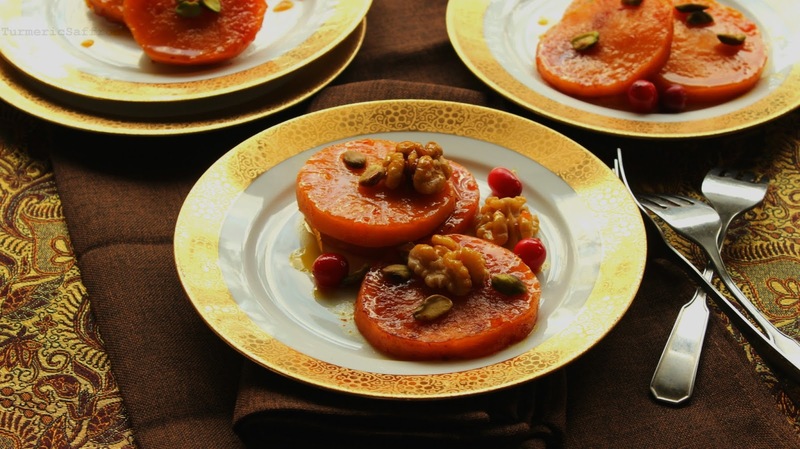 Arrange the butternut squash slices in a large pan, pour the syrup and saffron evenly over them. Bring to a boil, reduce heat to medium, leave lid ajar and cook 20-30 minutes or until the butternut squash is tender and all syrup is absorbed. Serve on the platter and garnish with walnuts and pistachios. 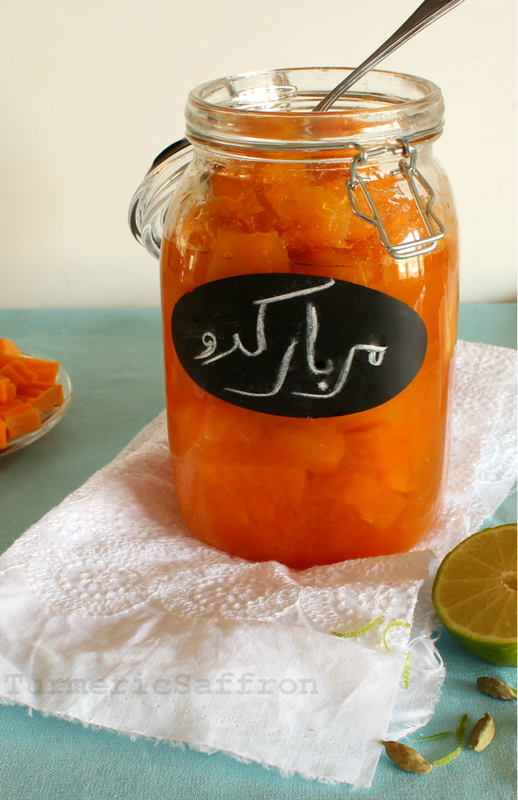 I have always wanted to make مربای کدو حلوایی - pumpkin jam but for one reason or another I never got around to it. 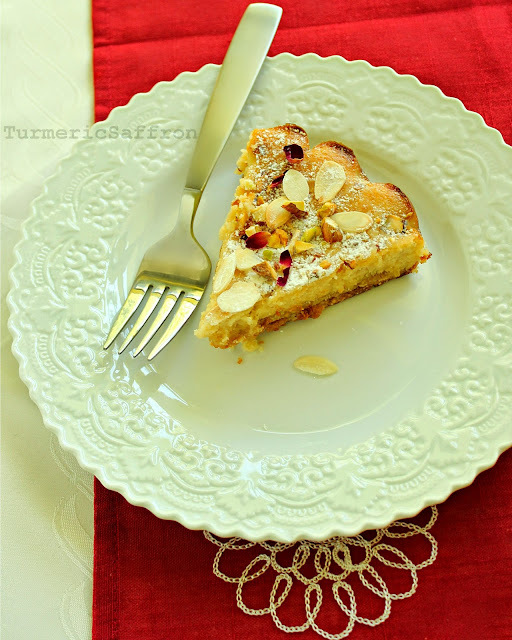 One reason was knowing that my modified version of this recipe wouldn't turn out as good as my grandmother's. I always knew that I had big shoes to fill when it came to cooking. 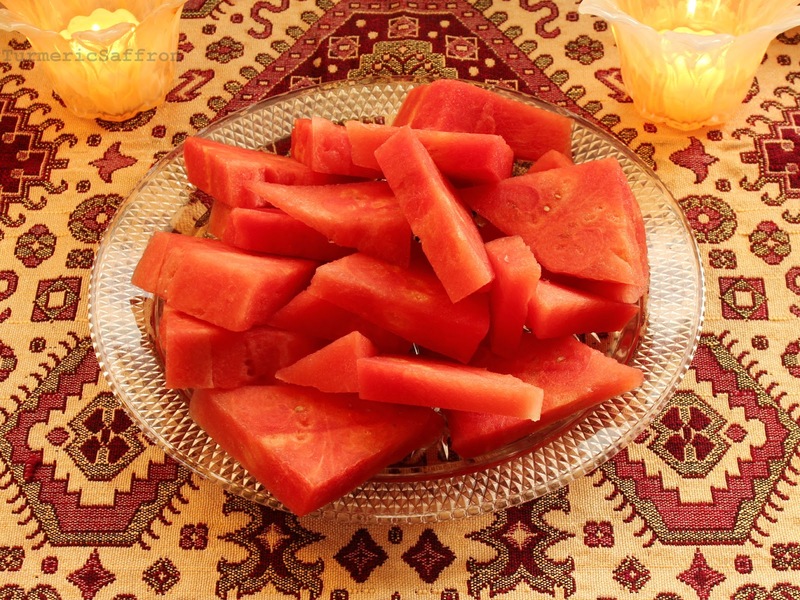 My paternal grandmother who we called Khanoum Ahvazi (lady from Ahvaz) was known for her delicious jams, pickles and khiar shoor (pickled cucumbers). All her food looked and tasted amazing. 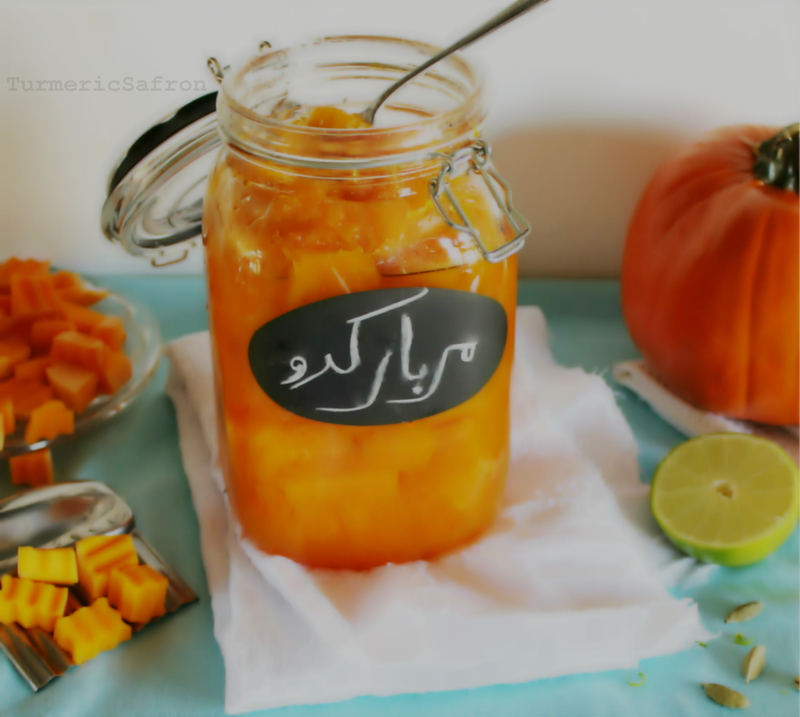 Khanoum's pumpkin jam was different from any other ordinary jam; the pumpkin pieces were somewhat transparent, crisp, and slightly crunchy on the outside but soft and perfectly sweet on the inside. 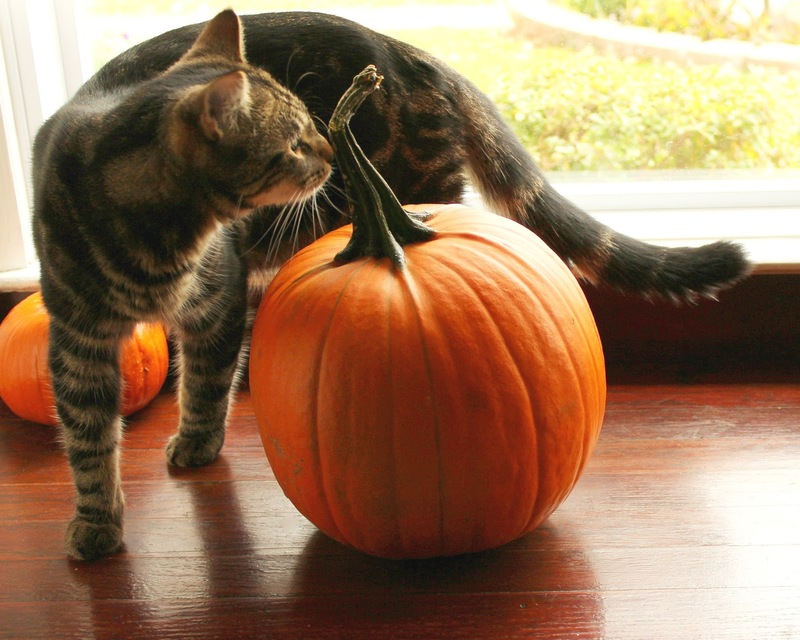 What made the pumpkin pieces become glass-like and crunchy was the use of آب آهک calcium oxide. I have been told that it's safe to use in food preparation if the directions are followed carefully. 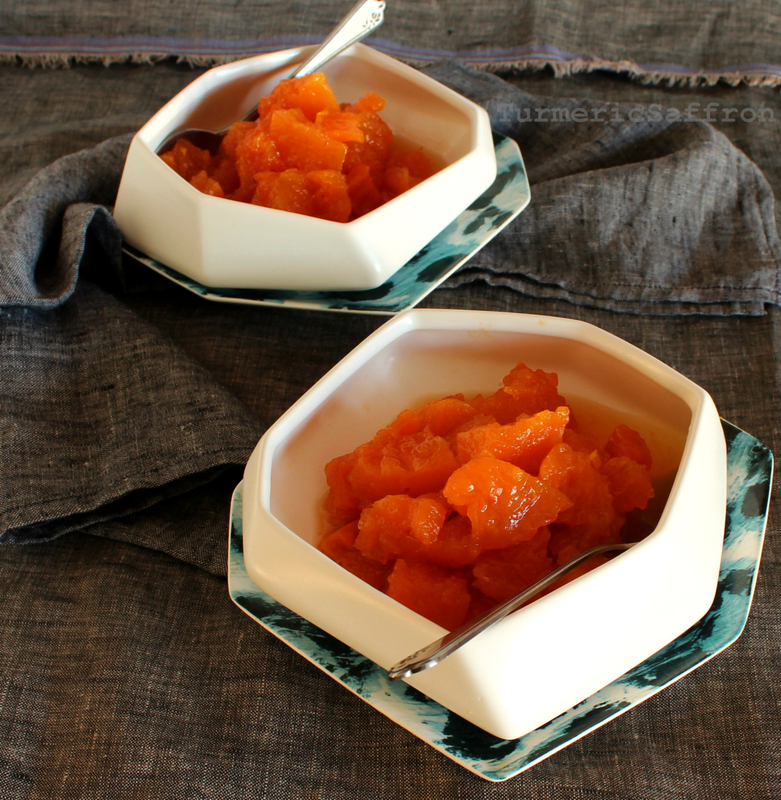 I imagine that my grandmother used her mother's recipe and that's how they all made this delicious pumpkin jam. However, since I am an advocate for non-chemical cooking I didn't want to use calcium oxide or any other kind of chemical in my cooking. Therefore, this recipe is not the exact same as my grandmother's. 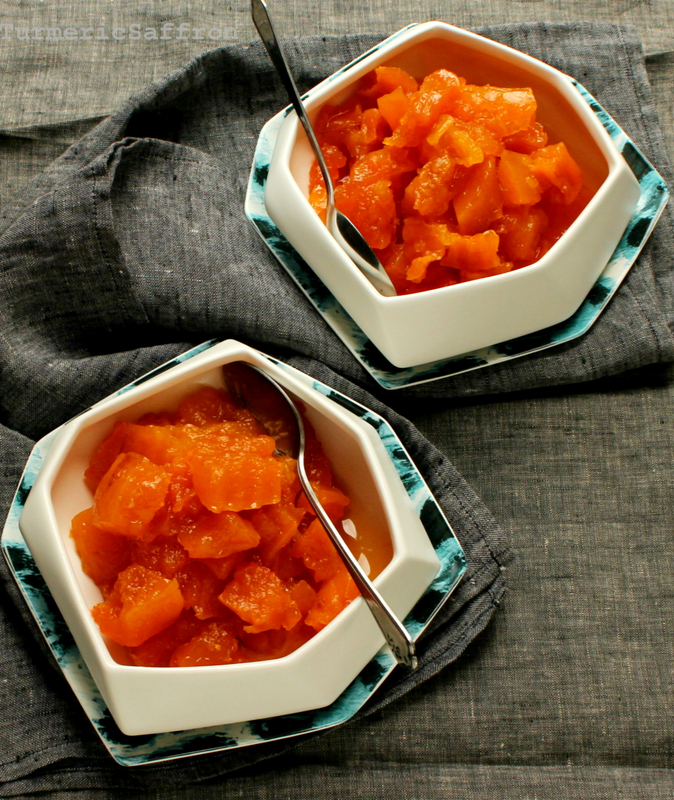 Not only did I not use the required calcium oxide solution, which was one of the key ingredients in this recipe, I essentially made this jam based solely on the memory that I had of its taste, texture, color and the nostalgic feelings for this childhood favorite. After making four different batches in an effort to get the pumpkin jam just right, I can finally say that I am pleased with the results and that this is also healthier version. In a small, heavy-bottomed pan, combine the sugar and water. Bring to a boil over medium-low heat until the sugar has completely dissolved in water, stirring occasionally. Reduce the heat and simmer on low heat for about 10 minutes or until the syrup slightly thickens. Set aside. 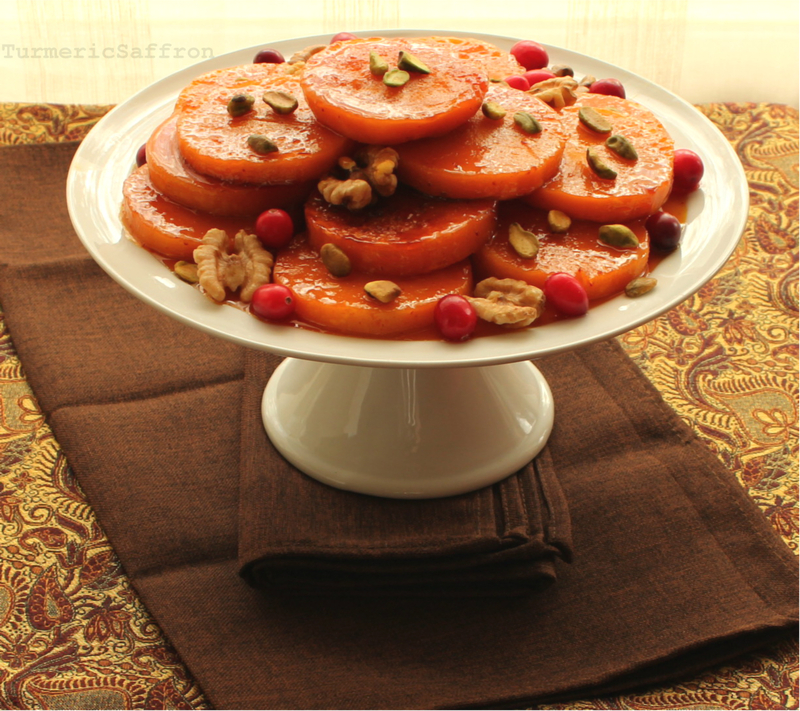 Put the pumpkin cubes into a large pot, pour the syrup over it and add the lime juice and cardamom. Bring to a boil for 5-7 minutes on medium-high heat. Reduce the heat to medium-low, placing the lid slightly open (ajar). Cook for an hour or until they are very soft, gently stirring occasionally. Add the rosewater in the last 10-15 minutes. You may want to remove the cardamom pods from the jam after cooking. 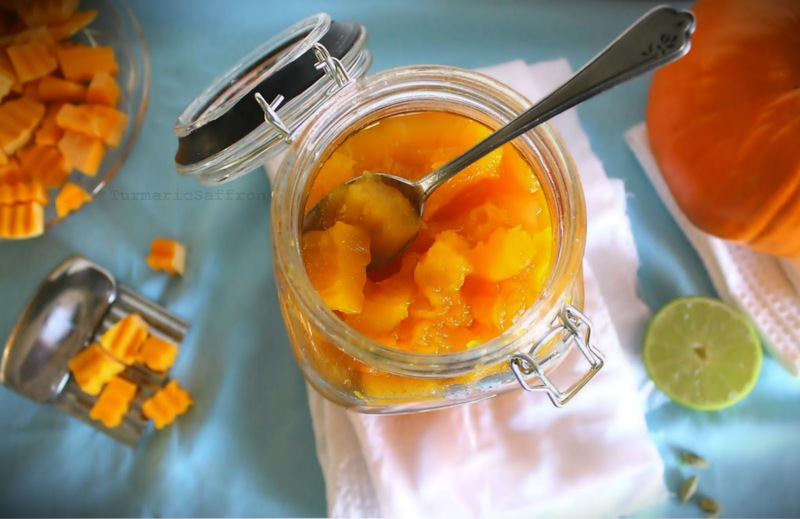 Scoop the jam into clean and dry jars and store the jam in a cool dark place or refrigerate. 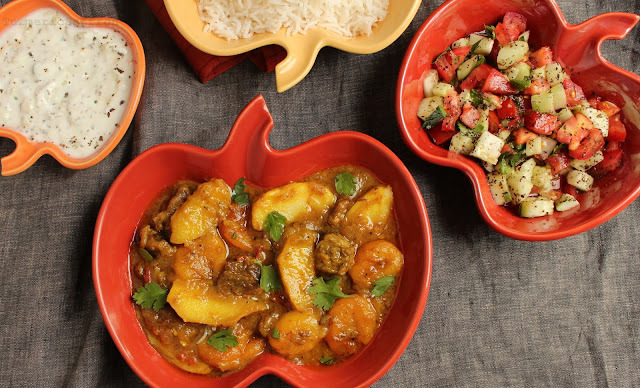 It's October and to celebrate the arrival of autumn, the most delicious season, I've decided to make خورش سیب و قیسی - Persian apple stew with dried apricots. 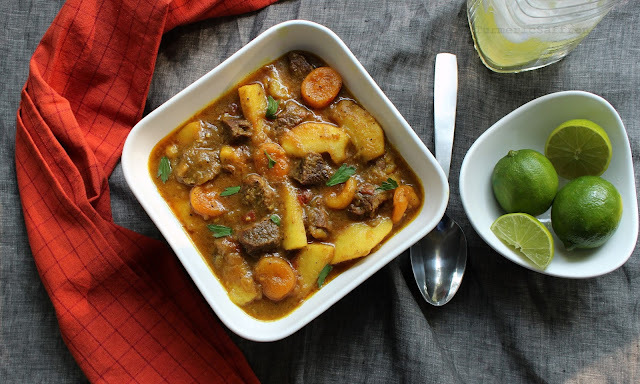 This is a vibrant and tasty khoresh - stew that is made with beef, tart apples, tangy sweet dried apricots, lime juice and a warm flavor of cinnamon. Fall is also the season for returning back to school, learning and gaining knowledge. 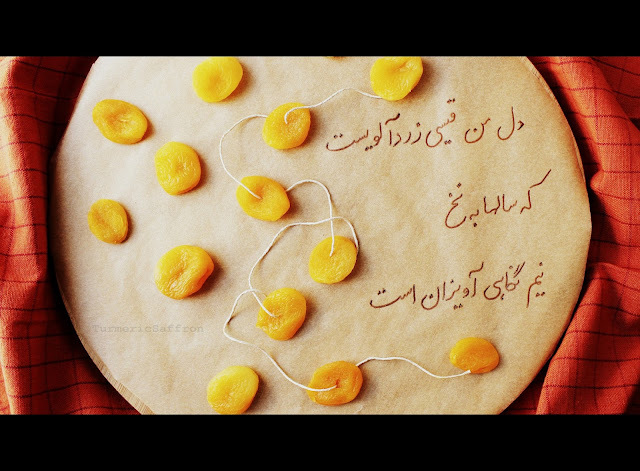 As someone who has been a Persian language instructor for a number of years, I'd like to say a few words to my dear, young Iranian parents out there. It's so important to teach your children the language of their heritage, to speak Persian at home as much as possible and to teach them the الفبا - alphabet. Learning a new language is not easy. It takes patience and persistence but it's well worth it. 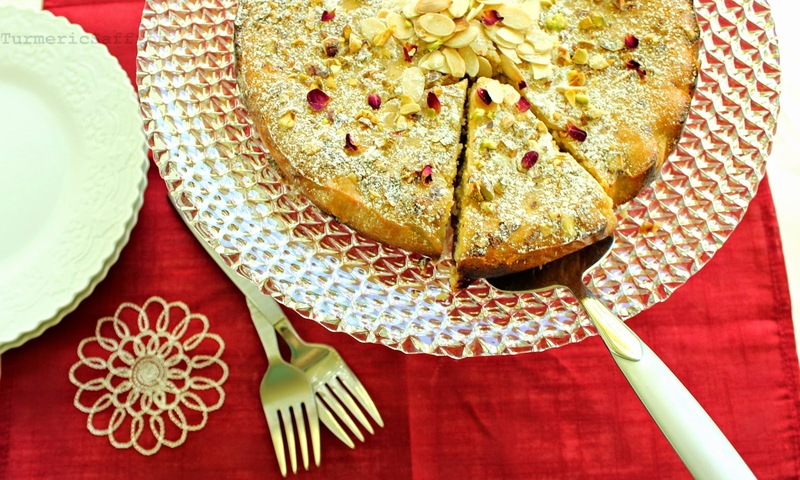 This recipe can be made with lamb or chicken and other fruits such as sour cherries and plums. I used Granny Smith apples because they are firm, tart, juicy and hold up well. 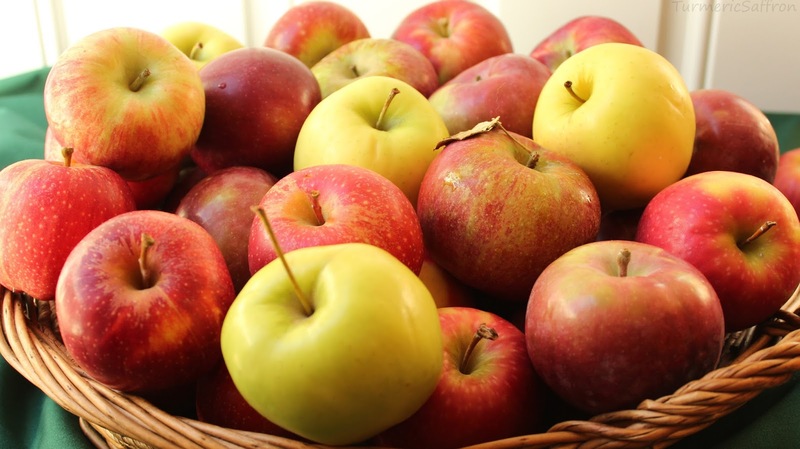 You can use any type of apple as long as they are tart, firm and good for cooking. 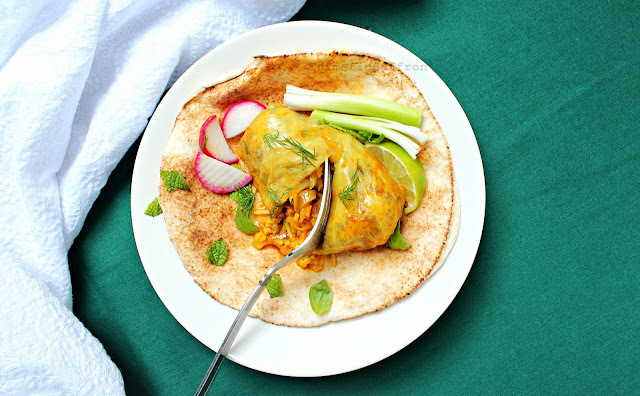 Those of who follow my blog regularly may have noticed that I seldom use ادویه - advieh, a Persian spice which is a mixture of many spices used both in stews and rice. Since this recipe requires a little bit of warm and earthy seasoning to enhance the flavor I made my own advieh but just enough for one dish only. 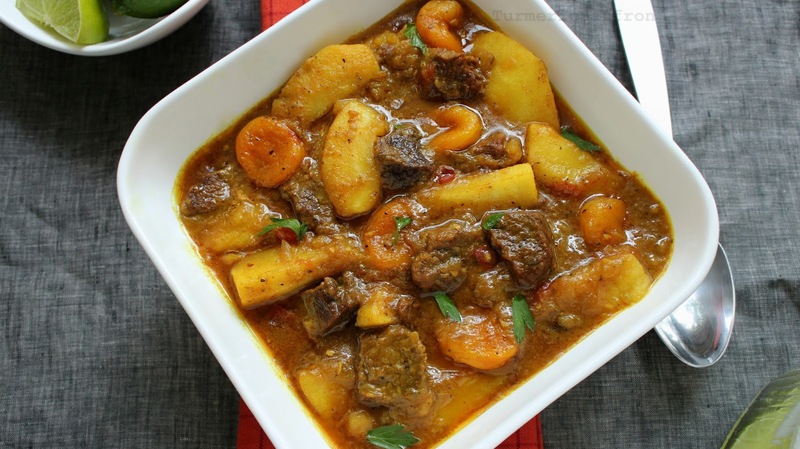 The necessary ingredients for advieh with the exact measurements are listed below in the recipe. 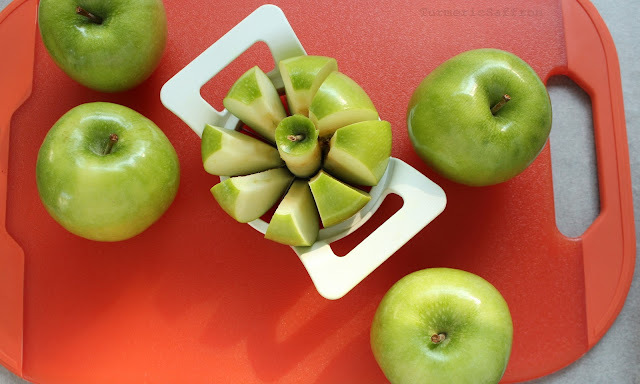 In a large bowl combine the apple slices and lime juice. Set aside. 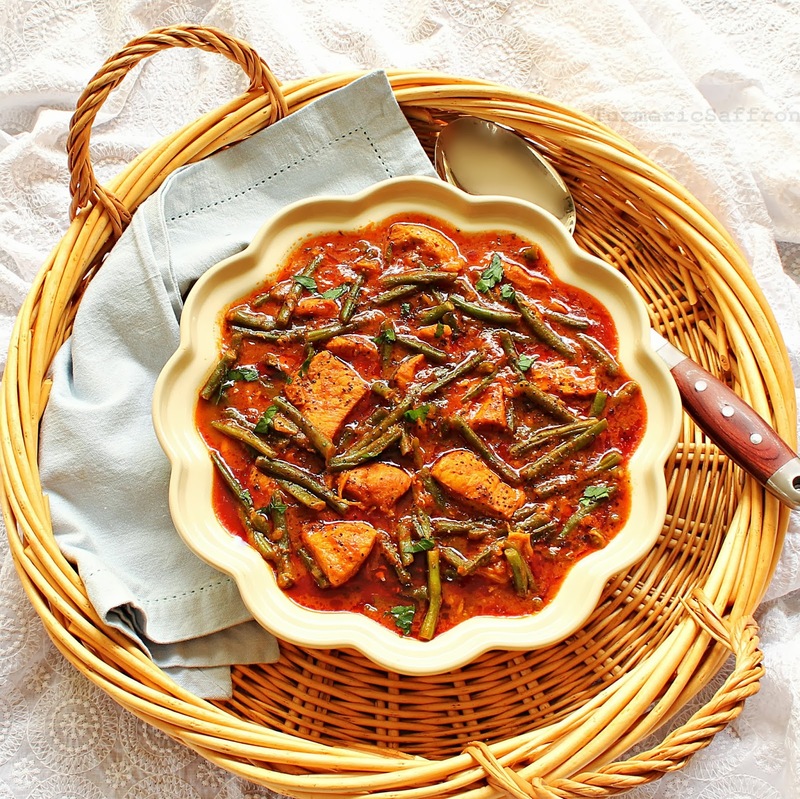 In a large stewing pot, add 2-3 tablespoons of oil, on medium-high heat, add the chopped onions, stirring occasionally, saute until soft and golden brown. Add the turmeric powder, stir well and add the minced garlic. Saute for a couple of minutes. Don't leave the pot unattended, garlic burns quickly. Add the beef cubes and brown on all sides. Add the tomatoes, crushed rose petals, cardamom, and salt and pepper to taste. Add enough hot water to cover all ingredients by 2-3 inches. Bring back to a boil for five minutes. Reduce the heat to medium, cover and cook for an hour or until meat is tender. Meanwhile, heat 2 tablespoons of oil in a large frying pan, add the apples, cinnamon, nutmeg, and cloves until apples are just golden and soften a little. Add the flour, stirring well to blend. Add the apples, apricots and sugar to the stew, cover and cook for 15-20 minutes on low heat until the flavors come together. Add a little water if necessary and adjust the seasoning. 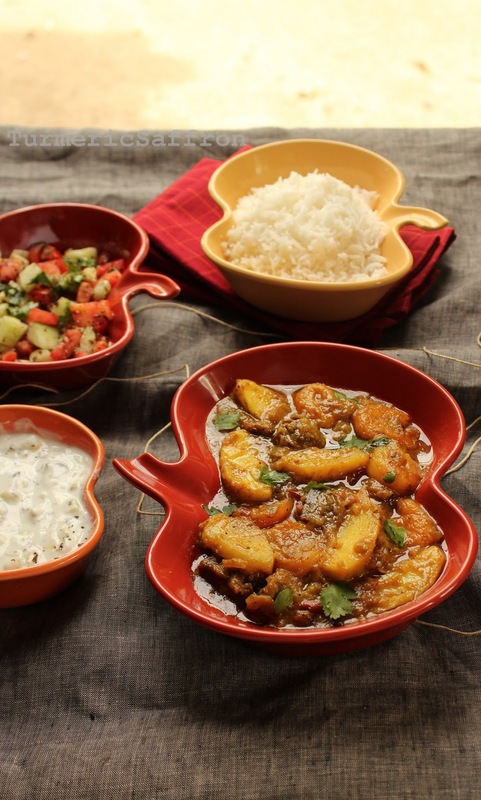 Serve warm in a bowl with rice, yogurt and salad. Recently, I had an interview with the Flavorful World blog. Here's the interview link. دلمه برگ کلم - Dolmeh barg-e kalam (stuffed cabbage leaves) is a variation of the well-known and popular stuffed vegetables genre known as dolma/dolmeh in Iran as well as among neighboring countries and different regions. 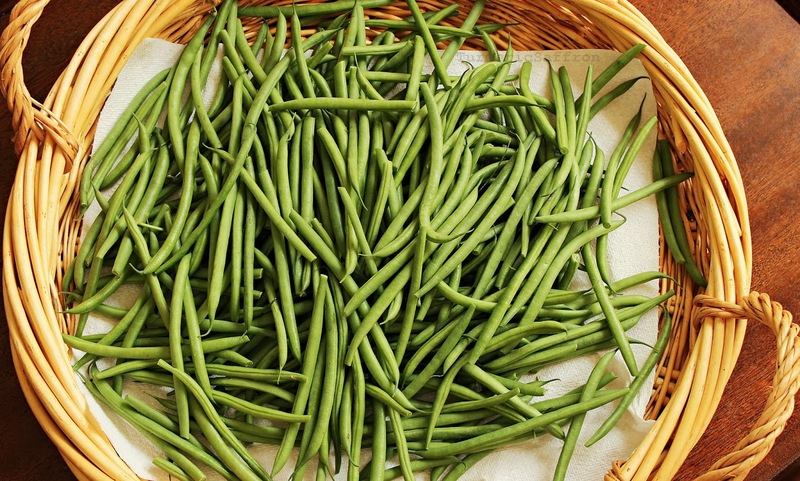 This recipe was a staple in our home growing up and one of my mother's personal favorites. 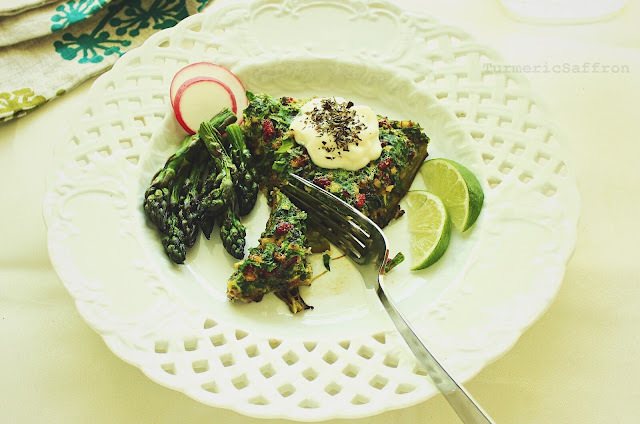 I had heard my mother's tale many times of how one Nowruz (Persian New year) when she was young, she single-handedly stuffed about 100 cabbage leaves with aromatic herbs, rice, meat and some raisins. And how this dish became her most exquisite and memorable dolmeh-ye kalam for all those family members, distant relatives and friends who were visiting during the Nowruz holiday. 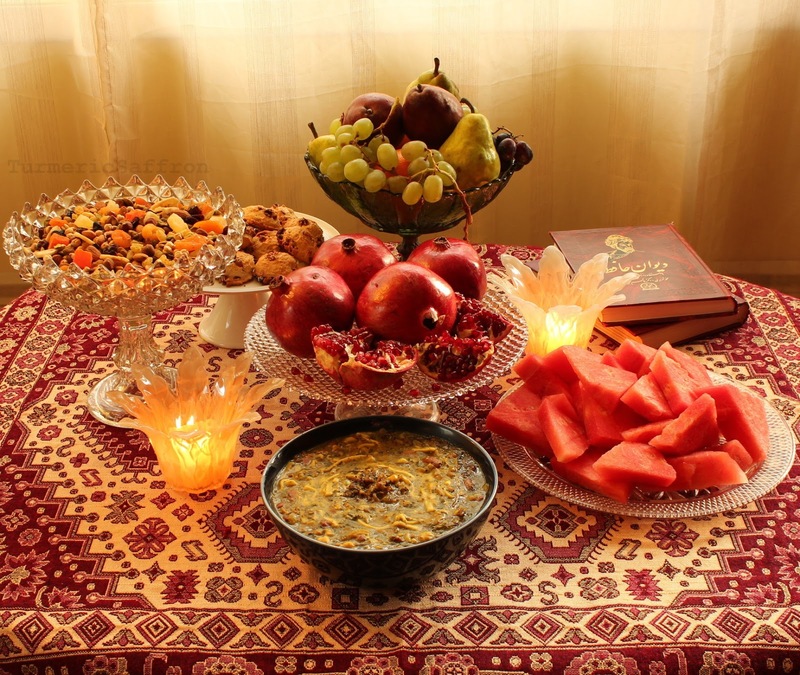 To achieve the best results in preparing Persian meals, besides having the basic culinary skills, you'll need to have a sense of appreciation for the creativity, wisdom, care and labor that goes into most Iranian dishes. 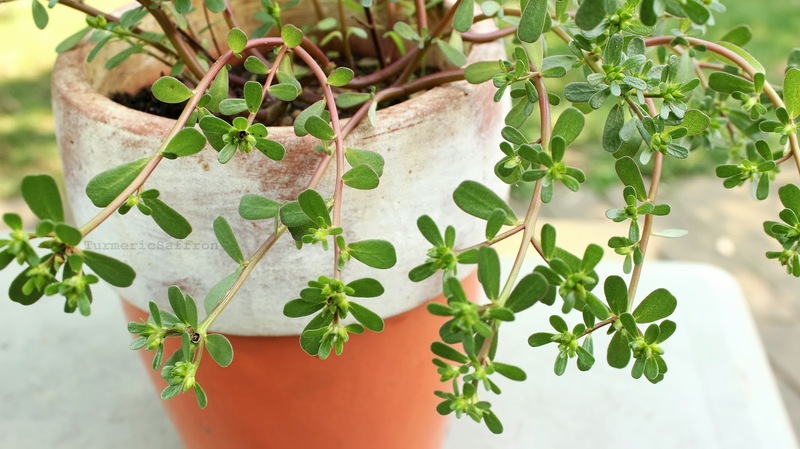 Along with cooking skills and enthusiasm, you will need a little patience as well. 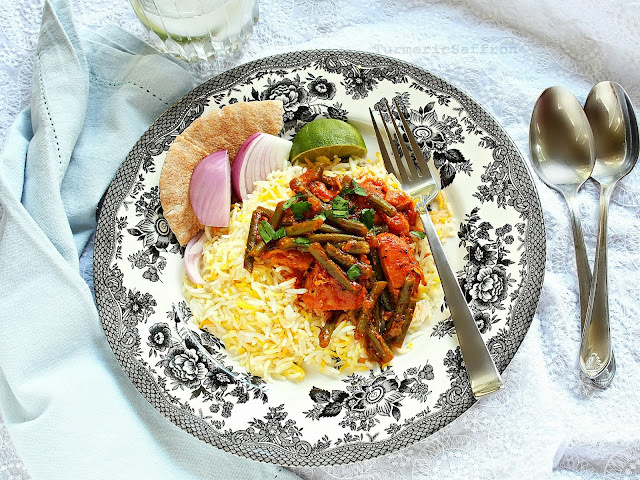 Persian food takes time to make but don't let that discourage you. In cooking, every ingredient counts and every step is important. 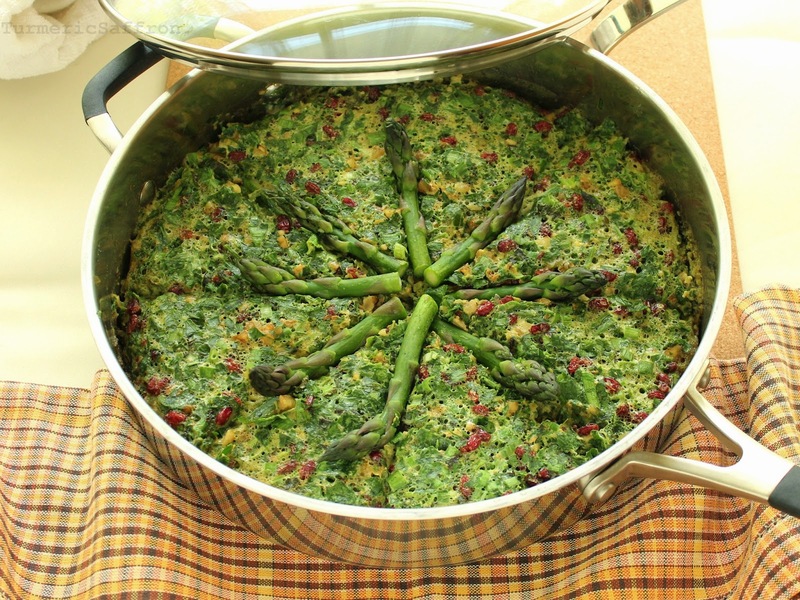 For those who are pressed for time or are not that into cooking, there are many classic Persian meals that are perfect for any time of the day such as: kookoo sibzamini, kookoo sabzi, borani esfenaj, kotlet, noon o panir o gerdoo (bread, cheese and walnuts) or noon o mast (bread and yogurt). Clouds, wind, fog, the sun, and the universe are all at work so that you would earn a loaf of bread and not consume it in oblivion. 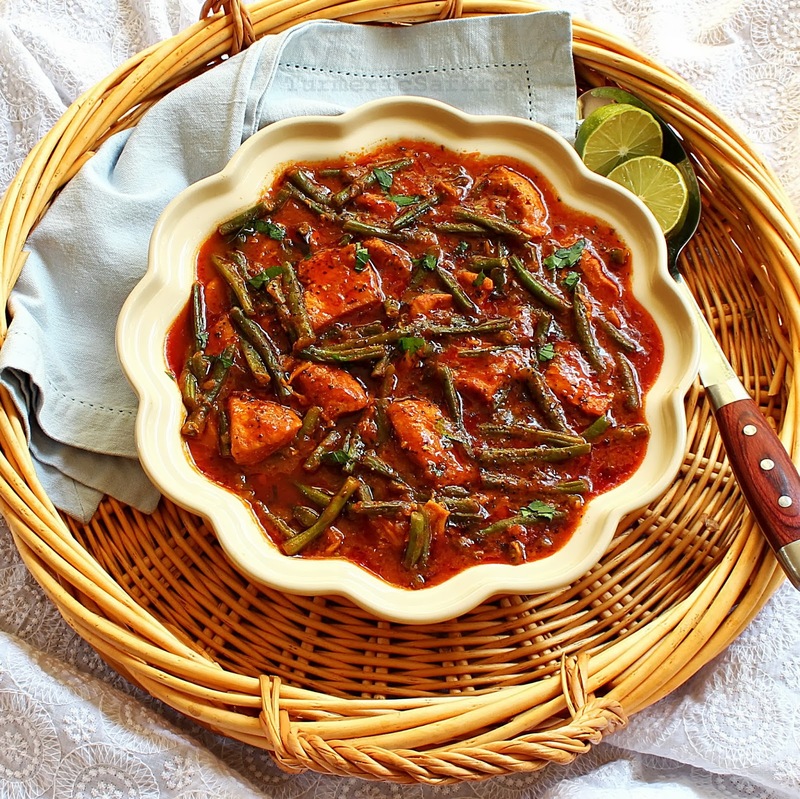 This dolmeh recipe usually has a sweet-sour flavor. However, depending on your preferences you can adjust the amount of sugar or lemon juice/vinegar to your liking. I don't add any sugar to my dolmeh since I like them more on the sour side. If you like adding raisins to the filling then that adds enough natural sweetness to the dolmeh which is a much healthier choice than sugar. You can add equal parts barberries and raisins to bring about the natural and delicate sweet- sour flavor in this dish. I also need to point out that my mother's original recipe did not include any tomato sauce - that's just my own addition, an ode to tomatoes. In a large pot, bring 6-8 cups of water to a boil over high heat, add a tablespoon of salt, gently add the head of cabbage into the boiling water, cook for 10 minutes. Drain. Peel each cabbage leaf, cut out the hard rib in each leaf. Set aside. In a large skillet, heat a couple of tablespoons of olive oil over medium-high heat, add the chopped onion, saute until light golden brown, add the minced garlic and the turmeric powder. Stir and saute for a few more minutes. Add the ground beef, salt and pepper to taste and brown until well done. Set aside. In a medium size pot combine the rice and the yellow split peas, add enough water to cover the rice by an inch over the rice line. Add a teaspoon of salt, a tablespoon of oil, bring to a boil over medium-high heat, reduce the heat , cover with the top a little ajar to let the steam out, cook until the water is fully absorbed. Set aside. In a large mixing bowl, combine the meat mixture, rice and peas, chopped herbs, cumin and saffron. Mix well. In a large pan, saute the sliced onion in 3 tablespoons of olive oil until translucent, add a tablespoon of tomato paste, saute for a couple of minutes until it's no longer raw, add salt and pepper to taste. Add three cups of water and bring to a gentle simmer. In the meantime, place a scoop of the mixture into the center of each cabbage leaf, fold in the bottom, sides and the top of the leaf to complete the wrap. 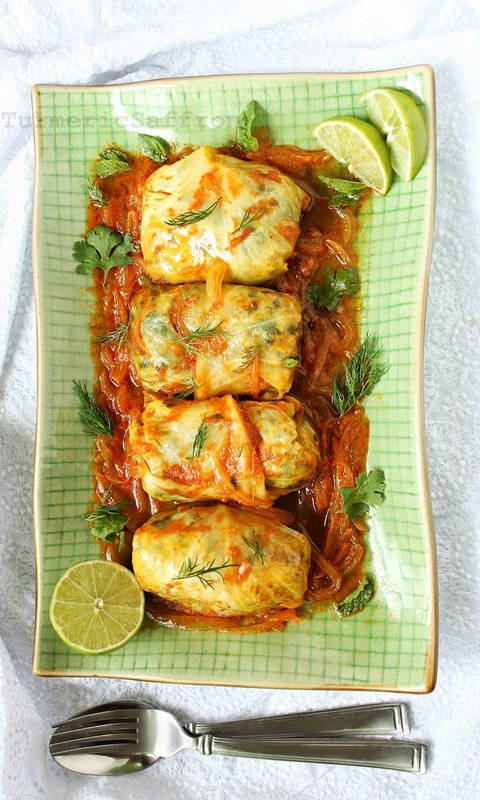 Arrange the stuffed cabbage with the seam down, next to one another in the pot. Cover and cook on medium-low heat for an hour. 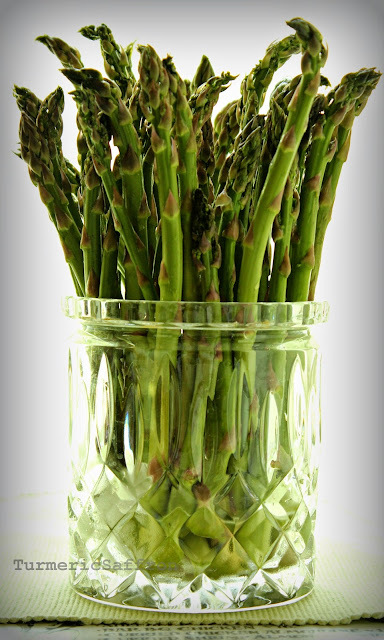 In the last 10 minutes of cooking sprinkle with 2 tablespoons of lemon juice or vinegar and just a sprinkle of sugar. Taste and adjust the seasoning. 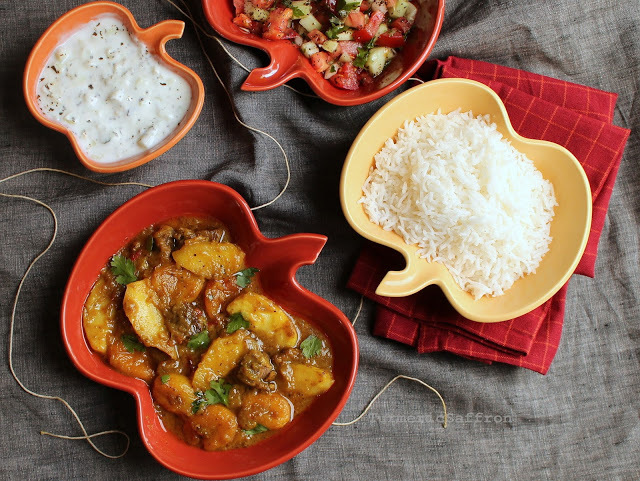 To serve placed the dolmeh on a platter and serve warm with mast-o-khiar and sabzi khordan. At the beach with family! 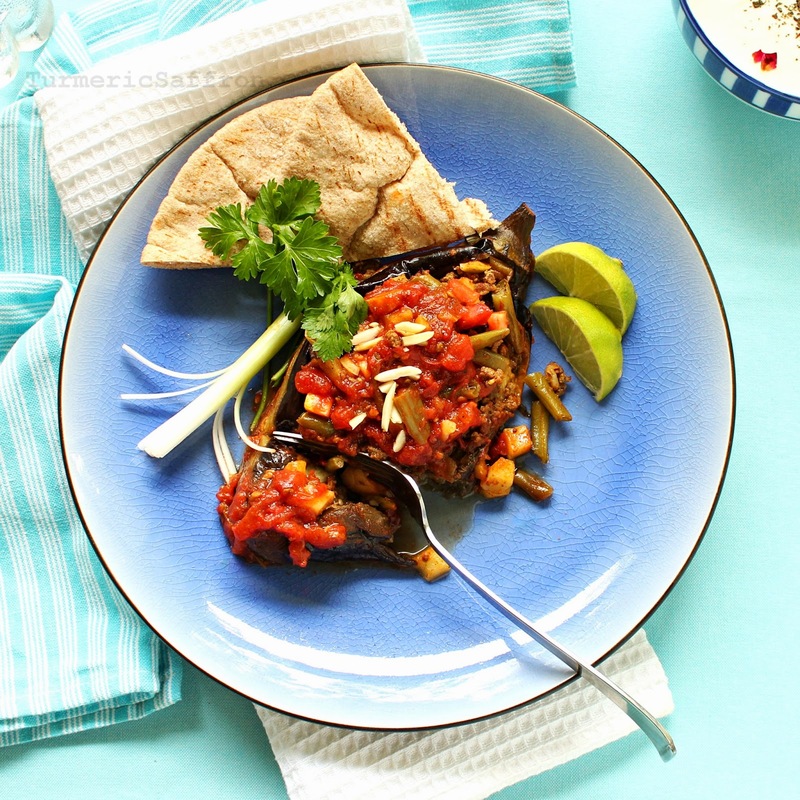 بادمجان شکم پر -Bademjan shekam-por is an open-faced fried eggplant stuffed with ground beef and vegetables simmered in a rich and tangy tomato-based sauce and topped with slivered almonds. This tasty eggplant dish is from the north-western region of Azerbaijan, Iran. I'd just like to point out that although the following words have a slightly different spelling and pronunciation, they all mean the same thing: بادمجان، بادمجون، بادنجان بادنجون - bademjan, bademjoon, badenjan and badenjoon. Eggplants have been part of the Persian cuisine for hundreds of years and due to their versatility, great flavor and silky tender flesh, they have brought about many popular and well-known dishes such as khoresh bademjan, borani bademjan, kashk-e bademjan, mirza ghasemi, and torshi bademjan (pickled eggplant), just to name a few. 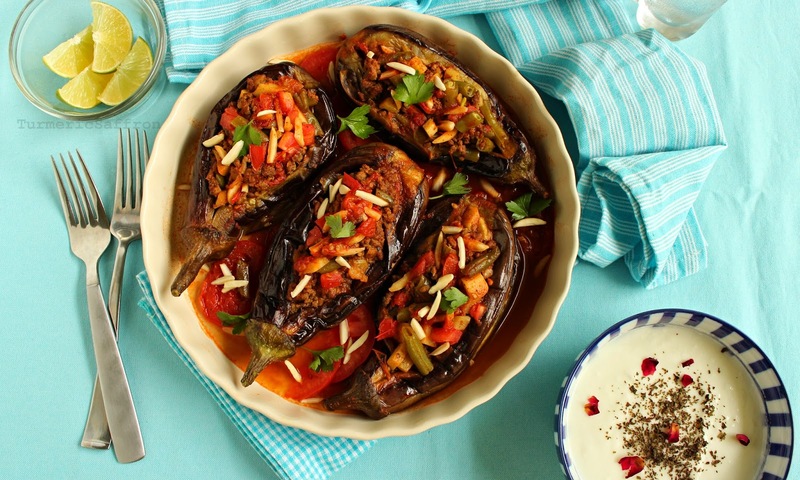 I am always looking for new Persian eggplant recipes and I'm determined to write about every eggplant recipe I find from homes in every corner of Iran. My favorite eggplant dish, however, is still simply pan-fried unpeeled eggplant slices lightly seasoned with salt and pepper. I personally like the taste of the eggplant skin and normally I wouldn't remove it unless I'm serving guests. 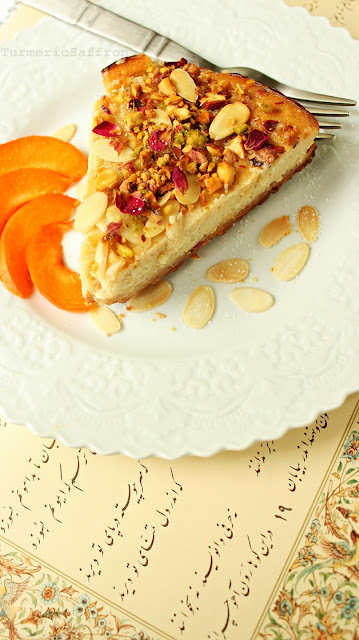 According to the article about Persian Food in the Huffington Post recently, "Persian food is criminally underrepresented in America." I agree with this statement and would add that in my opinion it is often misunderstood as well. 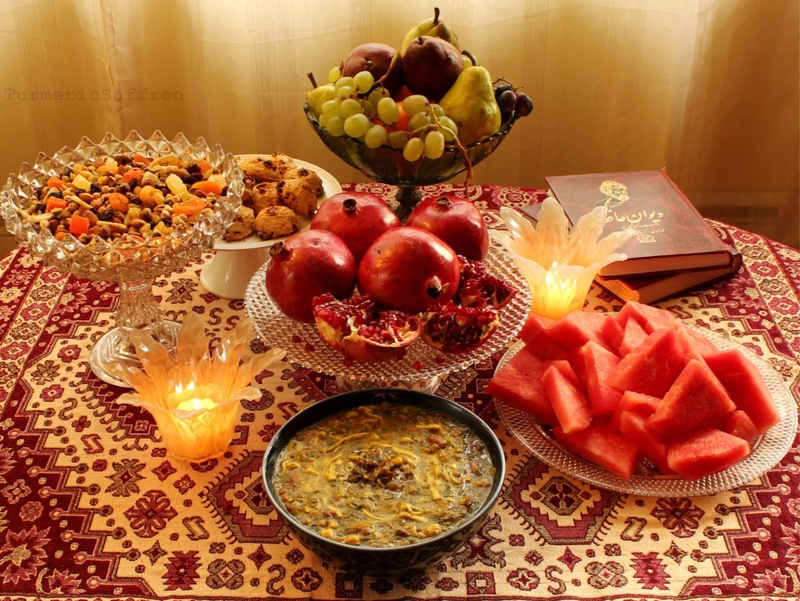 One of the misconceptions is that Persian food is not vegetarian friendly which in my opinion is not true. Aside from an array of globally known Persian kabab/kebob dishes, most if not all khoresh - stews can be prepared without meat. There are also many terrific vegetable dishes such as a variety of kookoo/kuku, borani and the hearty ash reshteh. Not to mention that there's always a platter of sabzi khordan - fresh herbs, as an accompaniment to lunch and dinner every day along with salad and torshi - pickled vegetables. Plus we eat fruits like there's no tomorrow! For a healthier version of a traditional bademjan shekam-por you can bake the eggplant in the oven before stuffing them or just prepare the dish the traditional way by frying the eggplants. Also, in the traditional recipe eggplant are peeled fully or partially by leaving in some stripes. 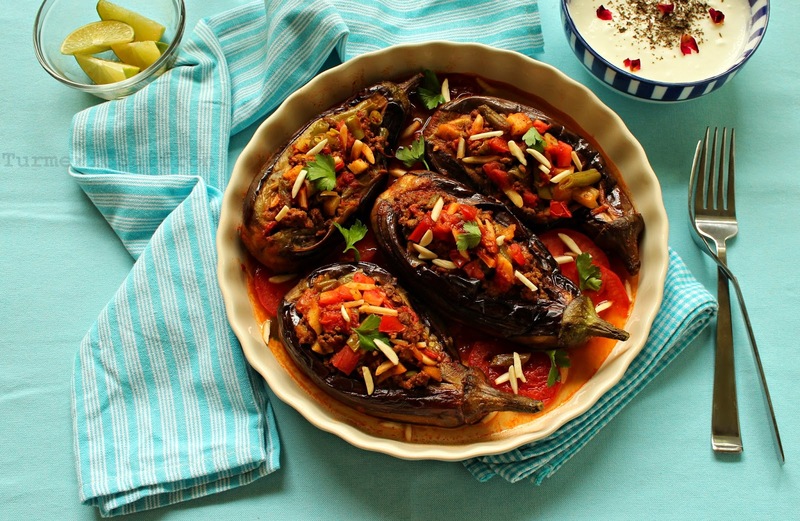 The choice is yours whether to bake or fry, remove the eggplant skin or leave it intact. 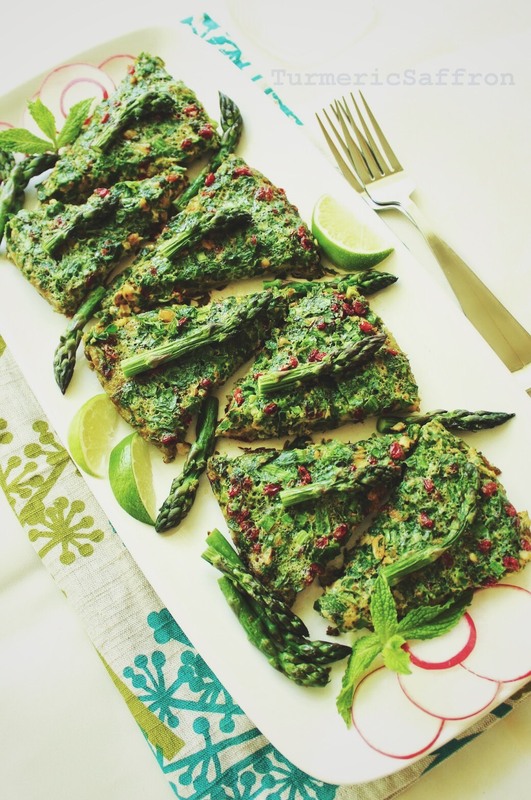 You may stick to a more traditional recipe or tweak it to your dietary needs and preferences. 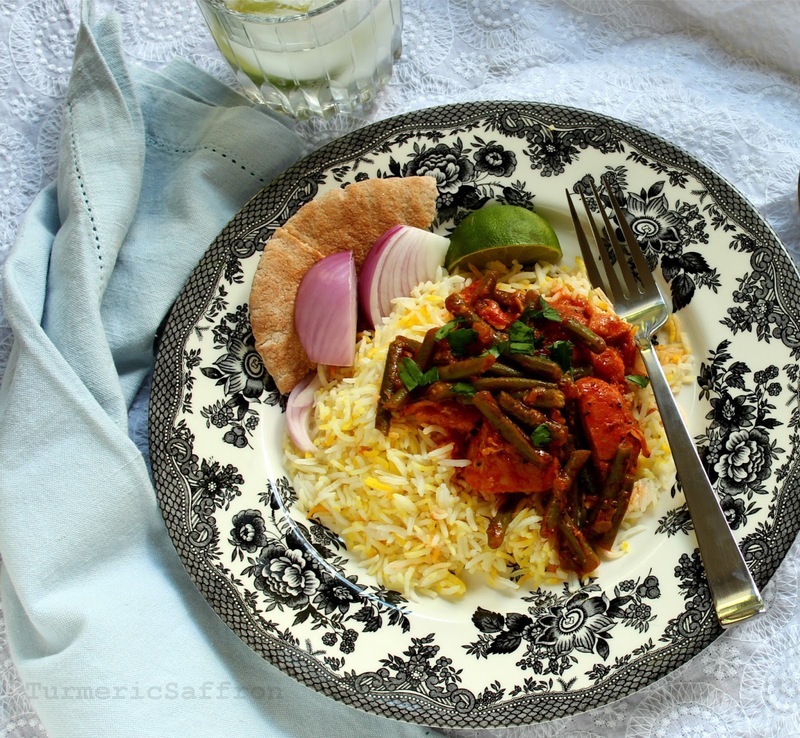 For a vegetarian variation of this dish you may use rice instead of ground beef. 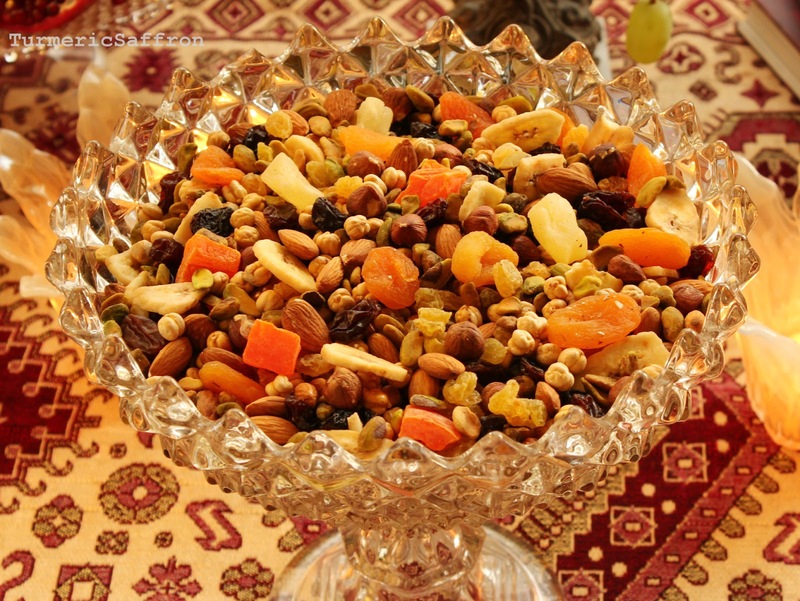 Bademjan shekam-por could be served as a main dish with rice or as a side dish/appetizer. 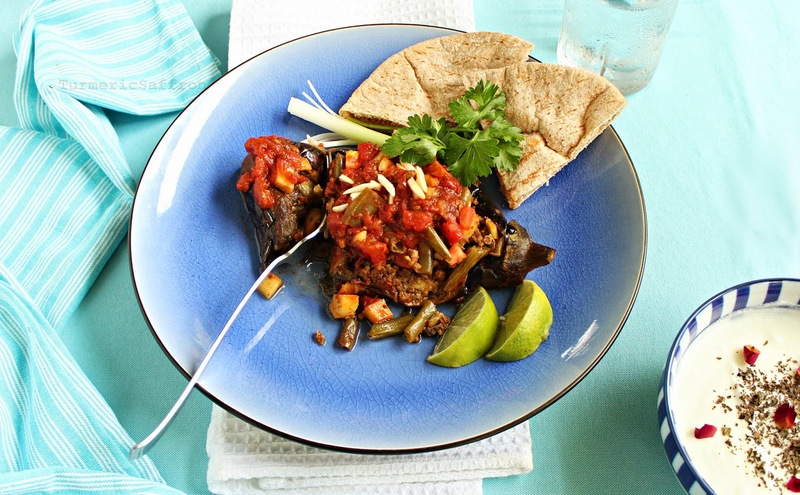 In a large frying pan heat 3-4 tablespoons oil over medium-high heat, fry eggplant until golden brown. Set aside to cool. In a large skillet, add enough oil to cover the bottom over medium-high heat, sauté the chopped onions until translucent. Add the minced garlic, sauté for a couple of minutes and then add the turmeric powder, stir. Add the ground beef and brown until well cooked and tender. Add the potatoes, green beans, and chopped tomatoes respectively and sauté each for a few minutes before adding another. Add cumin, red pepper and salt and pepper to taste. Sauté all the ingredients together. Stir well and add 1/2 cup of water. Cover and cook on medium-low heat for 40 minutes. Once the eggplants are cool enough to handle, gently cut open lengthwise. Sprinkle a small pinch of salt into the eggplant and with a fork gently loosen up the inside a little bit. 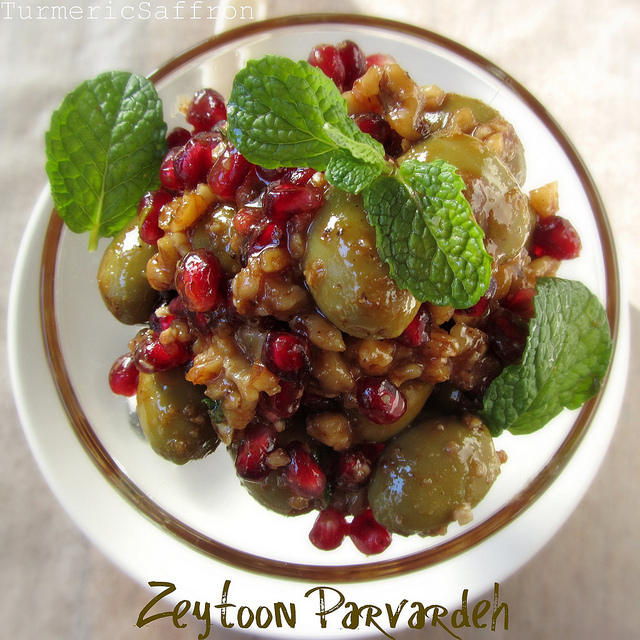 Generously spoon the mixture into the open eggplant and top with slivered almonds. In the meantime, heat a tablespoon of oil in a large pan over medium heat, add the tomato paste to the pan and stir well. After a couple of minutes, arrange the tomato slices in single or overlapping layers. Place the stuffed eggplant over the layered tomatoes, add a cup of hot water and fresh squeezed lemon juice. Cover and let simmer for 15-20 minutes on low heat. To serve place the stuffed eggplant onto a platter with rice or warm bread and yogurt.